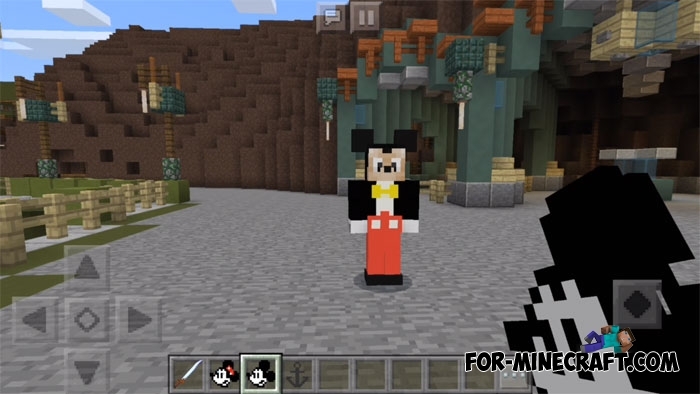 Old and well-known Disney characters got into Minecraft PE. Mickey Mouse as a symbol will live in your worlds and friendly attitude to any player. His friends Donald Duck and Minnie Mouse will never touch you, but as long as you treat them well. They do not have any special properties and they can not do different work and help you. It is best to connect this addon with DisneyLand. Download that map and spawn the cute characters for greater brilliance. Thanks to the opportunity to play with friends, Mickey Mouse and his friends can only enjoy their appearance. How to install Disney addon? DisneyLand map v0.7 for Minecraft PE 1.0.0/1.1.0Actually, it's almost the Disney park which consists of many entertainment zones..
Disneyland map for Minecraft PEDid you ever meet with their favorite characters, invented by Disney? With this map you will be able to realize his dream in life, going to Disneyland, recreated in a Minecraft PE!